I wish that I had a dollar for every walk I've been on that involved a hunt for plants. My friend, Victoria, a botanist who is world-renowned for her work with Eupatorium, a white flowered weed that has no utilitarian value in the human world (that I know of), often asks me to accompany her on ventures into places that are close to nature's heart and, sometimes, places that bear the signage: "Posted, No Trespassing." Yesterday, the plant hunt centered around bodies of water near Sewanee, Tennessee that are called lakes. I use the word "called" because to me, the ones I saw were more like ponds. I understand that there is a lot of uncertainty about what should properly be called a lake, and some simply define them as larger versions of ponds, or as bodies of water that are at least five acres or more in area; while others define them as twelve to twenty acres in area. I've read that in the state of Wisconsin almost every pond is called a lake; whereas in Newfoundland, every lake is called a pond. Whatever the ecologists say about the appropriate definitions of lakes and ponds, we walked the perimeter of Lake Cheston on Wiggons Creek yesterday, and I think that we must have covered close to two miles, sometimes walking over rough terrain where matted tree roots made the going difficult for an aging tenderfoot like me. We were trying to collect a water plant called the Yellow Floating Heart (Nymphoides peltata), a yellow-flowered species of plant that somehow got here from its native Eurasian habitat, was established in Quebec, and now occurs from New England southwest to Texas. We could not get close enough to the water to pluck a specimen so we stood on a bridge, attempting to "catch" a specimen with a long stick we had found on the trail. The floating heart-shaped leaves, with long petioles, grow so thickly that they form a network almost impossible to disturb with a stick. After numerous attempts, the botanist said, "I'm going in," and I shuddered because the ground around the lake's edge looked mushy enough to absorb a human up to the knees. As this particular botanist has been touted as someone who walks on water, often wading in marshes around south Louisiana to demonstrate to students how a plant can be captured in boggy areas, I was surprised when she turned back and decided that the Yellow Floating Heart wasn't worth the effort. 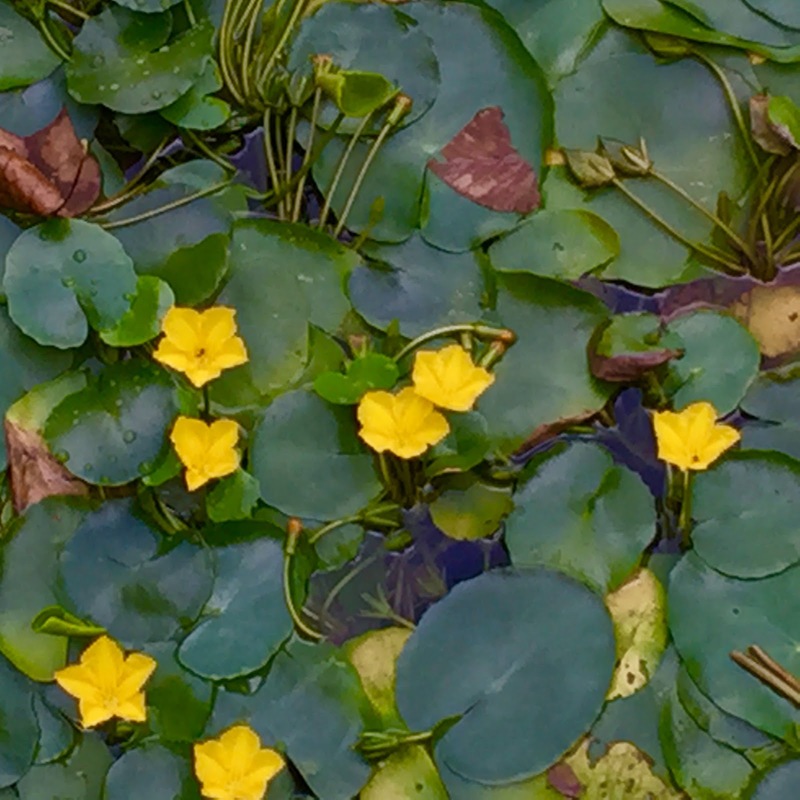 We continued to walk the perimeter and as we neared the beach area, I spied more of this water lily-like plant. 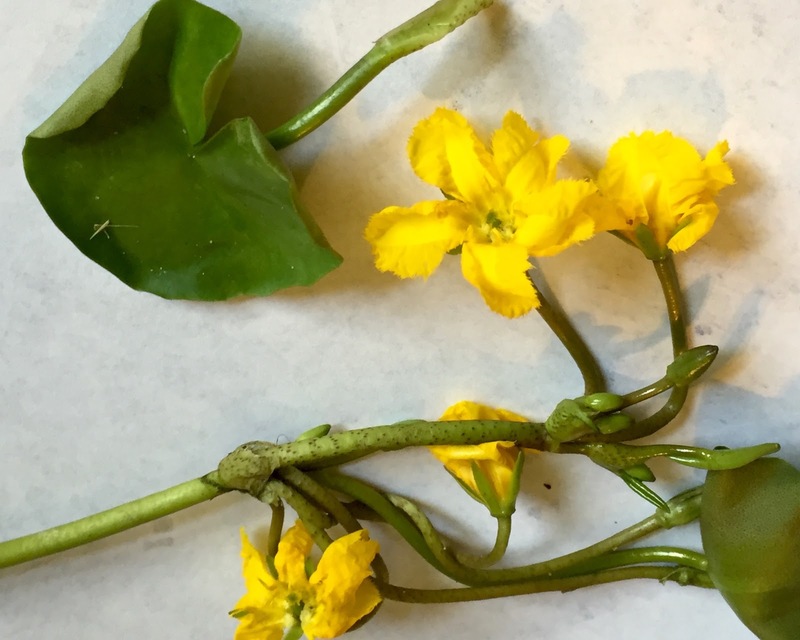 However, again, we were too far from the plant, and, again, the botanist gave up the catch, sighing heavily. As we turned to climb the hill where the car was parked, I looked down at the grass just beyond the lake's edge and at my feet lay a perfect specimen of the plant, its yellow face smiling up at me. "Eureka!" I said. "A floating heart. It followed us." I felt like I had found a Swamp Candle in a south Louisiana swamp or a wildflower in the crack of a city sidewalk! Readers may think that such finds are not so momentous, but I am proud to write that I've finally attained the title of "Amateur Botanist," with a specialization in the field of Yellow Floating Hearts. Walt Whitman wrote in A Song of Myself "I could turn and live with the animals, / they are so placid and self-contain'd, / I stand and look at them long and long / they do not sweat and whine about their condition..." Perhaps they don't whine about their condition, but they do get overheated and sweat (on their noses, of course). Lately, when we drive Templeton Way on our way to the Convent of St. Mary, we see a small herd of cows and calves bunched together, up to their bellies in a pond in the pasture where they graze. Although I'm one of those humans who's afraid of cows, dating back over seventy years, the distant sight of these bovine creatures, half immersed in pond water, becalms me. My first experience with a cow was not a good one. I was three years old and out playing in a side yard when I spied a cow tethered to a stake in a pasture alongside our yard in Baton Rouge, Louisiana. A young boy who was probably no more than ten seemed to be tending the cow, and he kept beckoning for me to open the gate in the fence that separated our yard from the pasture. Since my older brother only gave me attention when his six-year old playmates were away, it was one of those desultory days in hottest summer when I had no one to keep me company and nothing to do but poke a stick around in every hole I could find in the yard. So when I saw that finger beckon me, I ran to the fence and placed my hand on the latch of the gate. My mother, who had been watching from the kitchen window, flew out of the house, screaming at me: "Don't go near that cow!" The cow looked innocuous enough to me, but I was unfamiliar to her, and my mother was probably wise in alerting me to the danger. When I screamed back that I was going anyway, my mother slapped me for the first and last time I can remember experiencing corporal punishment from her during my childhood. The slap and the admonition not to go near the cow have stuck in my mind as a dangerous experience. Later, when I'd visit my grandmother during the summer and often walked up 10th Avenue to visit my aunt, I'd walk as close to the street as I could to avoid an old cow staked out in an unfenced vacant lot near the sidewalk. So I've never been near a cow, but I like to view them from a distance because they engender a feeling of pastoral peace. After all, they've been around as domestic animals for over 10,000 years and there are one billion of them alive and doing well. Those bovines clinging to one another in the pond at Sewanee create that peaceful feeling in me, and we took pictures of them yesterday—but from a distance and at a vantage point behind a barbed wire fence. new neighbors in Melli Rah. tend it in 110-degree desert heat. 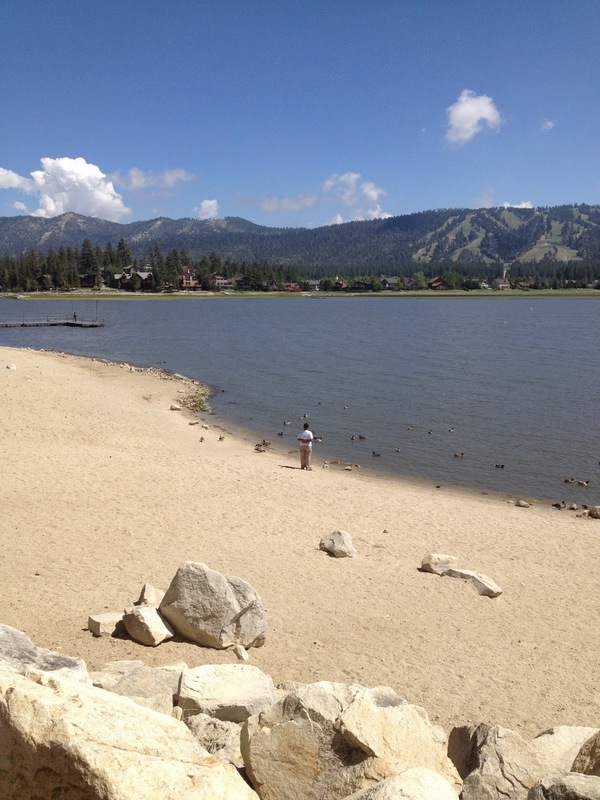 We left Big Bear Lake, California just a week before wildfires began to spark during this hot, dry summer season. I assume that the fires were spotted by some lookout with the Forest Service who mans one of those tall fire towers prevalent in the National Forests of the West. While at Big Bear, I thought about a vacation I've always wanted to take—not in a cabin but in a fire tower hideaway built by the CCC's during the early 1900's. During the 1940's, 4,000 lookout towers were built in National Forests, but today there are only 900 left (over 500 active and abandoned ones in California), and if you have the camping bug and don't want to invest in tents and camping equipment, you can rent one of these towers for $30-$50 a night. The space is small—12 to 15 sq. feet—but most of them have heat, table, chair, and a bed but no water or electricity. However, the panoramic views from these eagle perches are said to be unforgettable, especially from the Little Guard Lookout in northern Idaho that touts sweeping views of the Bitterroot Mountains. The Forest Service still uses many lookout towers, using mapping tools to determine the location of fires, and both men and women man them. According to the National Forest Foundation, in 1913, Hallie Daggett became the first female lookout in the Forest Service and spent fifteen years working in the Eddie Gulch fire tower in Klamath National Forest in northern California. My deceased brother Paul drove us through part of this forest near the border of Oregon back in the 90's, and the firs and incense cedars there were breathtaking. When I returned from California a week ago, with visions of fire towers dancing in my head, I picked up The Messenger, our Sewanee, Tennessee newspaper, and voila! 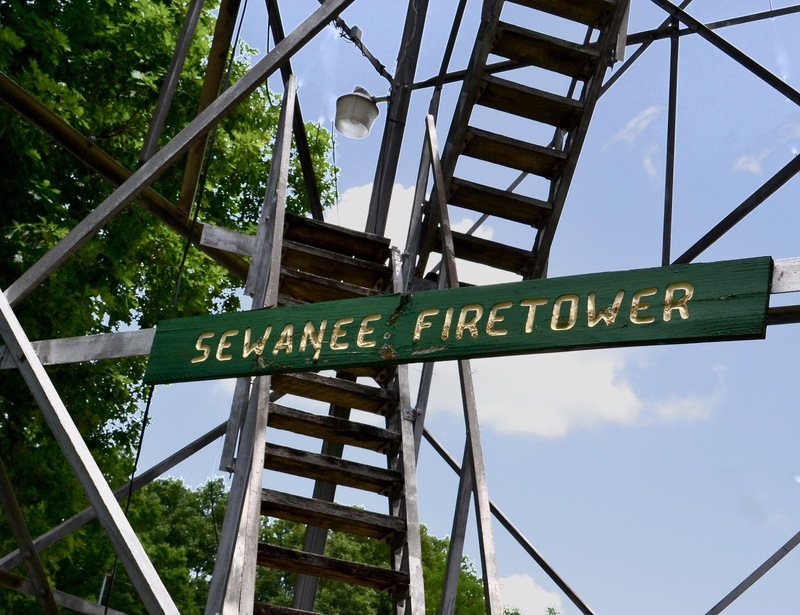 Right on the front page was a story about the Sewanee Fire Lookout Tower, a site that has been added to the National Register of Historic Places by the Tennessee Historical Commission. The site will be listed under the Tennessee Division of Forestry Fire Lookout Towers, 1933-75. 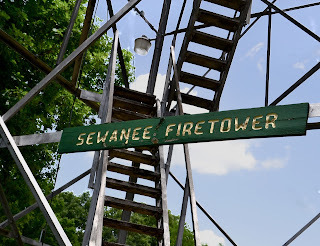 The Sewanee Lookout Tower is described as an Aeromotor MC 39 steel structure built from 1933-34 by the Civilian Conservation Corps and is in a complex that has several other buildings constructed in 1934: a crew cabin, a vehicle service platform, and the lookout operator's cabin. In 1940, a new crew building was built, and in 1950, a radio tower was added. 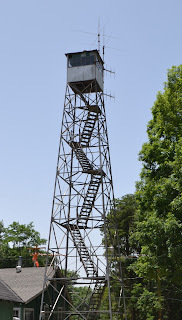 Although I have no intention of asking for a room at this local fire tower, we drove out to the site located on Fire Tower Road and took a look at the historic place this afternoon. It isn't quite high enough to provide the panoramic view that I imagine as part of fire tower charm, but I could envision it as a writer's retreat in a rustic setting. As I'm spooked by lightning, I don't think I'd like any of the western towers because of their susceptibility to lightning strikes. Towers in the West, located high on mountain tops, are natural conductors of lightning and have to be grounded with copper wires. The wires attract lightning strikes and cause the electrical charge to go deep into the ground where it is dispersed. However, I'd still hyperventilate if lightning hit any tower in which I was having a private retreat! If you're interested in lookout towers in a National Forest, check out the recreation.gov site. Or if you're a Sewaneean, drive out to Fire Tower Road and take a look at a cultural resource that has been deemed worthy of preservation, but I don't think it's available for rental. Although I'm fond of California, eight years passed before I finally made a trip west to visit my daughter in the high desert of Palmdale, California last week. I've missed my annual week of revivification in the warm, dry climate that clears up allergies, arthritis, and other maladies endemic to the Deep South. When I was eleven, I developed a liking for the climate and landscape of the desert during our sojourn in "Diddy Wah Diddy," my father's name for California. I was shocked to see the skeletal-looking Joshua trees (my favorite species of desert trees) on the landscape, but shouldn't have been as the high desert in California is experiencing severe drought—the region has averaged only about four inches of rain in several years. The Joshua tree has been called the "cultural signature of California's desert landscape," and grows only in the Mohave Desert. The seedlings of these picturesque trees are shriveling up and dying before they can put down roots, and scientists say that the trees may lose up to 90 percent of their range in the 800,000-acre Joshua Tree National Park by the end of this century if the drought persists. My daughter lives in the Antelope Valley where water usage has been limited due to the drought, and water agencies have begun planning for more storage facilities to capture water available during wet seasons—some have even suggested building a Bay-Delta twin tunnel project and to limit the amount of water being diverted to protect the Delta smelt. Currently, my daughter is abiding by the mandate to limit outdoor water use, and her once-green yard reflects that limitation. She's considering graveling the entire expanse of front and side yards. We also visited Big Bear Lake (elevation 6743 feet!) while traveling in Diddy Wah Diddy and found that a four-year drought has resulted in the lake being eleven feet down from full. For the last three years, this area has experienced a drought condition that resulted in fifty percent less than the average amount of inflow into the Lake. 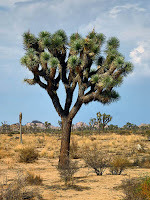 But back to the Joshua tree, a succulent known as Yucca brevifolia. The tree grows up to forty feet high and lives more than 200 years, sporadically putting out yellow and white bell-shaped blossoms. Unfortunately, during the 1980's when Palmdale and Lancaster, aka the Antelope Valley area, were booming, 200,000 Joshua trees were replaced by housing tracts and shopping centers (my daughter lives on one of the housing tracts!). Then, during the 1990's, exotic grasses began to grow among the trees because of conditions triggered by El Nino, and the grasses caused the forests of Joshua trees to become vulnerable to brush fires. As we drove through the Mohave, I kept lamenting about the stricken forests of trees and consoled myself with the fact that because the Joshua trees grow for about 200 years, I wouldn't witness large-scale die-offs during my lifetime, but I hated to see the demise of any of these desert beauties. Mormons named the Joshua tree after the biblical character Joshua. They were traveling through the Cajon Pass to Utah in 1857, and it is said that they envisioned the trees as prophets and that their outstretched arms pointed the way to the promised land. While traveling from Lake Tahoe back to Palmdale one summer, I scribbled twenty poems that included a brief notation about sighting a Joshua tree, a snippet entitled "Near Cartago, California: Population 75:"
And if you want to read more about these dying desert attractions, there's a "tome" online entitled Joshua, My Love. The book was written by Mary Austin, a woman who fell in love with Joshua trees when she moved to Antelope Valley in 1937. 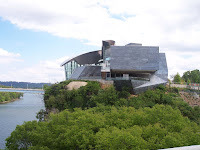 Yesterday, after morning services at St. Mary's Convent, Sewanee, Tennessee, we decided, on impulse, to visit the Hunter Museum in Chattanooga, which is an hour's drive from Sewanee. When morning temps in early June average 60 degrees, travel is pleasant, and temps were still mild at noon when we arrived and took a table at the Rembrandt Cafe. Fearless sparrows and grackles were busy on the patio, daring to land underfoot to pick up the crumbs of early lunchers. The cafe's specialty is a tomato-artichoke soup and fresh bread from a bakery located on the block beneath the cafe area, so we dined well, sitting near a large fountain that provided an added attraction for the brown sparrows at my elbow. The Hunter Museum, across the street from The Rembrandt Cafe at Bluff View, was only steps away, and we renewed a lapsed membership before viewing the exhibit that had attracted my interest: Eudora Welty and the Segregated South, a gallery of photographs by one of my favorite southern writers. The photographs were billed as explorations on both sides of the color line in the "Jim Crow South" of her native Mississippi and were on loan from the Knoxville Museum of Art. I wasn't allowed to photograph the exhibit, but the running texts documenting Welty's experience in a segregated South provided material for some memorable storytelling. During the 1930's Welty worked with the WPA (Works Progress Administration) conducting interviews in her home area near Jackson, Mississippi. Welty's keen powers of observation and what is described as "sly humor" delineate the color differences in arresting photographs about the effects of Jim Crow laws on Mississippi's majority African American population during this time in the deep South. One gelatin silver print, dated 1935, that Welty snapped is entitled "Saturday Strollers," a photograph of three southern African American women dressed in chic gowns, high heeled shoes, and stylish hats, strolling on their afternoon off. Their stroll is impacted by a farmer dressed in worn-out overalls leaning against a storefront, as Welty catches the woman in the left side of the photograph stepping behind her companions so that she can create a space on the sidewalk between herself and the white farmer. She is carrying out the Jim Crow rule of "giving whites the wall." The text accompanying this photograph explains that Welty has cropped the photograph to emphasize the farmer's posture, and he is described as "casting a shadow over the women's leisurely stroll." As my great-grandmother Dora Runnels Greenlaw lived in Copiah County, Mississippi during the early 20th century, I was drawn to a photograph shot in that area entitled "Tomato Packers' Recess, Copiah County." The print showed migrant workers, who were often displaced sharecroppers, gathered around a central guitarist, looking as though they needed the music as a respite from harvesting seasonal crops. The men's bent legs are described as a "rhythmic pattern...creating a sense of unity and uplift." One of the most arresting photographs in the exhibit, "Preacher and Leaders of the Holiness Church," shows a picture of worshippers at the Church of God in Christ Holiness Church. In this picture Welty shows the spiritual aspects of the church by capturing the sunlight glowing in the window of the church and the incandescent light that illuminates the glowing faces of the women who are known as "Sanctifieds." This photograph appeared in an article in Vogue magazine, and Welty's text included inappropriate remarks that reflect the prejudices of the time as she described the appearance and behavior of the preacher: "The preacher shown here at top, was a little man, jet black, with monkey features and antics." A stark photograph shows African American workers going home before sundown to avoid the "sundowner laws" that forced these workers, who were employed in town, to go home before dark or risk being arrested, sometimes lynched. Welty shows a long road in the foreground leading to the cart carrying the workers, and the photograph frames a barren landscape with only one tree showing in the distance. A print of a houseboat family on the Pearl River that brought back memories of fishing trips I once took on this river, a haunting photograph of an abandoned lunatic asylum, and Welty's famous photograph of a bottle tree in a barren-looking yard—these were among the stories Welty told in this visual narrative of the segregated South. I returned to Sewanee with a copy of Art View, the Hunter Museum's quarterly magazine underarm and opened it to a page that featured a cutline by the photo editor Kathy Ryan: "Often the best creative work happens when there is a crossover between different disciplines." An apt phrase to describe a Pulitzer Prize winning writer like Eudora Welty, who was not only one of the South's premier authors, she was recognized as an accomplished photographer.